Last weekend, while our politicians were doing their last minute scrambling and a certain bearded fellow was getting smoked across the pond, a crew of local geeks took over an entire Markham high-rise hotel to celebrate a subculture you’ve probably never heard of. An offshoot of the cyberpunk and speculative sci-fi literature of the past few decades, steampunk falls somewhere in the murky realm between aesthetic and genre. Science fiction writer J.M. Frey describes it as “a toolbox you apply to a genre,” where the Victorian-era excitement of Imperialism and scientific discovery are reframed without the troublesome baggage. Exhibition co-organizer Adam Smith. Photo by Jon Medow. The result? Goths, anime lovers, cosplayers, and sci-fi fans donning gears and goggles, building steam-powered robots. Picture the 1999 Will Smith remake of Wild Wild West and graphic novel-turned-film, The League of Extraordinary Gentleman. Sepia-toned tech nerdery with a suspension of disbelief. 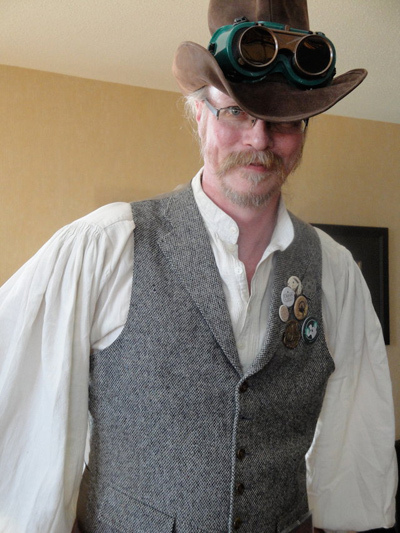 Smith, a soft-spoken gentleman dressed as a sort of retro-futuristic cowboy, describes how different geographic takes of the steampunk genre have developed as the movement has grown. He explains that Americans are drawn toward the pioneer West sensibility of outlaws and saloon girls, where U.K. steampunks tend to favour the waistcoats and top hats of proper Victoriana. Beyond the getups, there’s the literature. Then, there’s the possibility for convention breaking. “Steampunk is really just a blank slate,” says Kenneth Shelley, also a costumer. This bodes well for readers tired of satisfying their adventure cravings with what Gerlach describes as the “hero, villain, damsel-in-distress” constraints of traditional superhero lit. It also makes room for the female protagonists and feminist perspectives so often excluded from the male-dominated world of fantasy fiction. Toronto is an unexpected hotbed of steampunk activity, and the scene is beginning to bubble beyond the underground. Locally-based juggernaut Harlequin Enterprises is debuting The Steampunk Chronicles, a young adult series, at the end of this month. Area writer Adrienne Kress has written a number of popular steampunk children’s titles, including the forthcoming The Friday Society about a group of bold, mystery-solving teen girls. Maureen Jennings’ Murdoch Mysteries novels, set in 19th century Toronto, have become a Gemini-award winning television series with a four season (and counting) run. 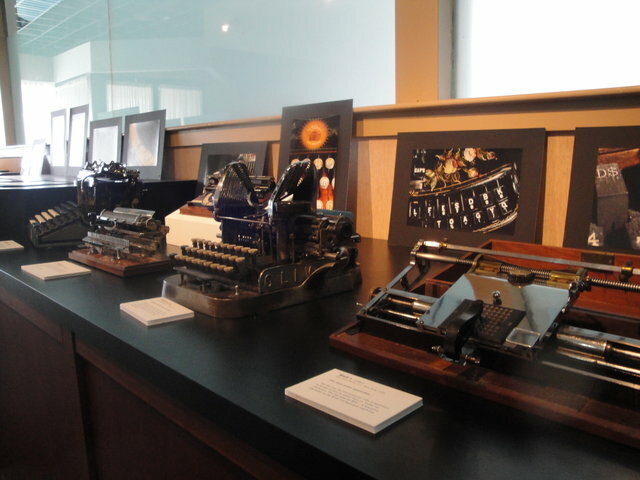 The Steampunk Canada fan group behind the exhibition is based locally. 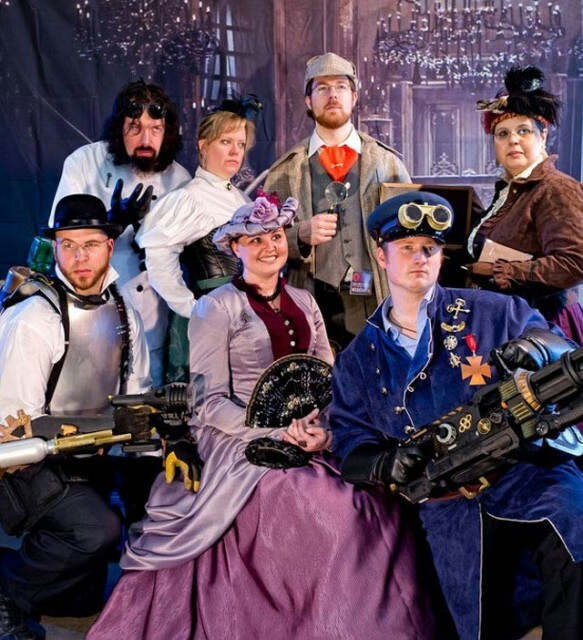 And, last but not least, is the Toronto Steampunk Society, whose Facebook page alone boasts an excess of 1,000 members. Not bad for a subculture of a subculture. Will Toronto be the city that brings steampunk to the mainstream? The appropriate response is to keep an eye on your oh-so-steampunk pocket watch, as only time will tell. All photos in lead image gallery by Iden Ford Photography.